Someone actually puts one over on Perry in this episode. When wealthy art connoisseur Otto Olney throws a party to celebrate his purchasing a rare painting by Gauguin, he is furious when a party guest named Durant says that the painting is actually a fake. Perry comes up with a plan to have Olney sue Durant for libel. But here's where Perry�s been had. Durant claims he never said anything about the painting and the only witness, a woman named Maxine, agrees. * When Perry tries to get in touch with her, he learns she�s left for an art school and won�t testify. Since he can�t catch up with her, he tries her apartment for a clue and finds the dead body of Colin Durant, fully clothed, in Maxine�s shower. The police get to Maxine when Paul does and arrest her for the murder of Colin Durant. Perry takes the case and is thrust into the world of art collectors and art forgers. * Webmaster�s Note: Joel Peebles notes that Maxine did not agree. In fact, she gave Mason and affidavit stating that Durant did tell her that the Gauguin was a forgery. The painting The Three Witches also appears in #132, �TCOT Posthumous Painter.� See appearances here. Submitted by Xanthippe Svanstr�m, 12/24/2003. The painting seen in the hall outside Goring Gilbert�s place can also be seen in #146, �TCOT Absent Artist,� and #260, �TCOT Sausalito Sunrise.� See here. Submitted by Leah, 1/29/2003. The Crying Cherub painting from #89, �TCOT Crying Cherub,� and seen in #146, �TCOT Absent Artist,� can also be seen in Goring Gilbert�s studio. Submitted by daveb, 12/4/2007. + The painting of the "little lady" that intrigued Otto Olney when he was in Leslie Rankin's gallery was also seen (barely) in episode 48. Alan Smithee, 3-15-2015. Sightings: In the courtroom, �Miss Carmody� & Quiet Old Man #1 observe the proceedings, while Distinguished Gentleman #1 works the stenotype. Learn more about these frequent faces. Submitted by gracenote, 2/22/2011. + Earlier, the aformentioned Gentleman, along with a companion, is led in the background by the m�itre d� to his table in the restaurant where Colin Durant confronts Perry. Later, he appears, back to the camera, in the background of the bus depot, and he�s talking to yet another lady. Then he reappears in the depot at least twice more, walking in the background. Submitted by gracenote, 8/2/2011. CARS. There are over ninety background cars in this episode (36 in the opening pan shot alone!). Except for the two buses, I have not listed any of them. (1) Colin Durant's medium-color 1963 Buick Wildcat Convertible, top down, License No QCV 014. 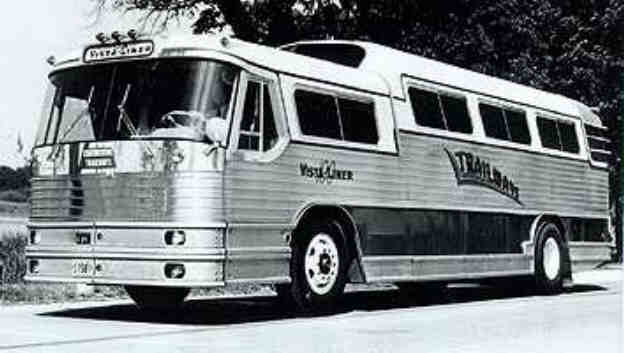 (2) at the bus depot, a 1954-1959 Flxible VistaLiner VL-100, 39-passenger deck-and-a-half inter-city bus in Trailways livery. It was fit for "The King". (3) at the US/Mexico border crossing, a 1948 ACF-Brill IC-41. The bus line's logo seems to be the California Grizzly, as on the state flag. "IC-41" = inter-city 41-passenger. (4) Perry's OLD 1962 Ford Galaxie 500 Sunliner top down, with the expired 1956-pattern YELLOW-plate Licence Number XCF 015. This is another re-use of one of two Season 6 Courthouse Location-Setters; this is the one with the line of traffic on Hill St and not showing Paul's TBird parked behind Perry's car. The next episode #188, at 32:06, uses the other version showing Paul's TBird. (5) Lt Anderson's black 1963 Buick LeSabre 4-Door Sedan, Lic No QCV 007. Andy first had this car in Ep#185. Since the introduction of the 1963-pattern black-plates in Ep#173, the old yellow-plates now stand out like sore thumbs. Added by Gary Woloski, 2/11/14. Charles Irving [Zipperman] played Judges in 11 Perrys (4%: 7 generic, 2 Judge Blanchard, 1 Judge Stanley, 1 Judge No. 1), 3 Bonanzas, 2 Ben Caseys & a Judd For The Defense & Alfred Hitchcock Hour; in Bonanza "A Passion For Justice," he prosecuted Charles Dickens, played by Jonathan [LIS Dr. Smith] Harris [IMDb]. Mike Bedard 3.2.15. The summary states, "[Perry] finds the dead body of Colin Durant." It's actually Della who finds the body and calls out to Perry. Is this the only episode where Della finds the body? jfh 25Dec2017. I must have missed something - is it ever explained why both Olney's had copies made? And what was Leslie Rankin's part in all this?